You may have noticed that some of the sewing bloggers you read have been exchanging handmade Christmas ornaments and posting tutorials demonstrating how to make them too! Well, thanks to Kelli of True Bias, more bloggers (like myself) were given the opportunity to sign-up to participate in this activity as well. 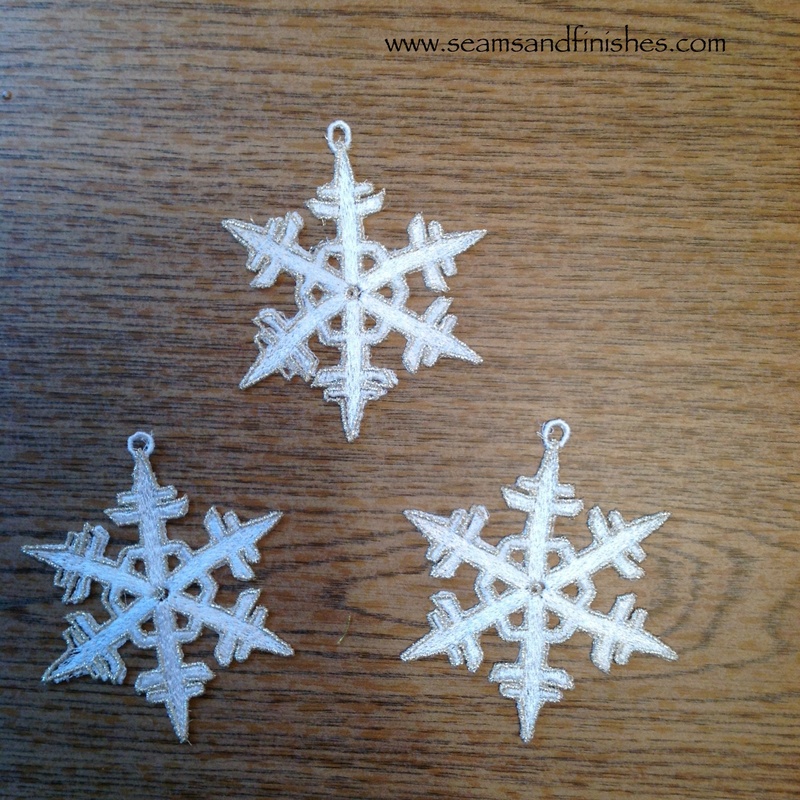 I submitted my name as a participant, and decided that my handmade ornament would be to make lace snowflakes! The bonus here is that you can either hang them on your Christmas tree, or enjoy them in a window throughout the winter season! 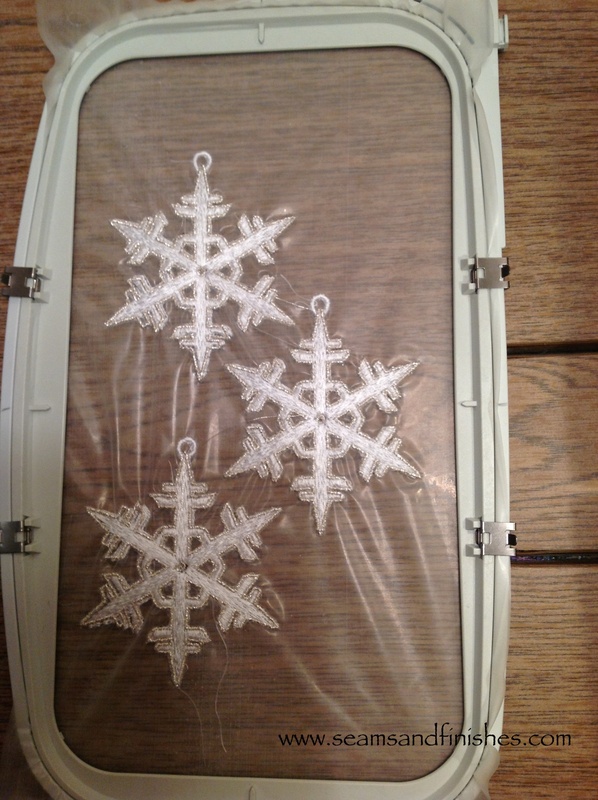 if you are not familiar with machine embroidery, these snowflakes are known as FSL, or Freestanding Lace. I purchased these particular designs from Snowlady Designs but there are many other vendors of lace designs. After downloading the design to my computer software, I duplicated the design as many times as I could fit into my hoop and then transferred that to my machine. 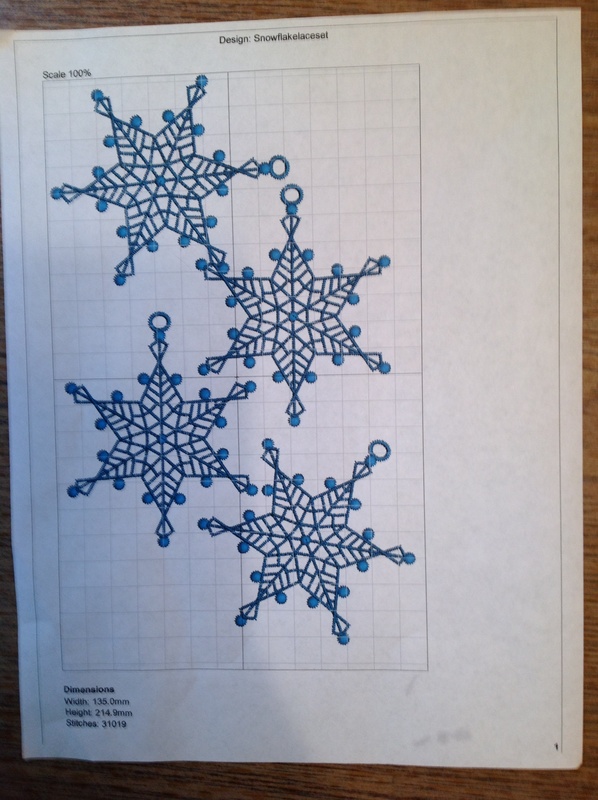 Here is a print-out of the snowflakes as they will be stitched. Next, I hooped a thick water-soluble stabilizer, pressed the “start” button and watched them stitch! 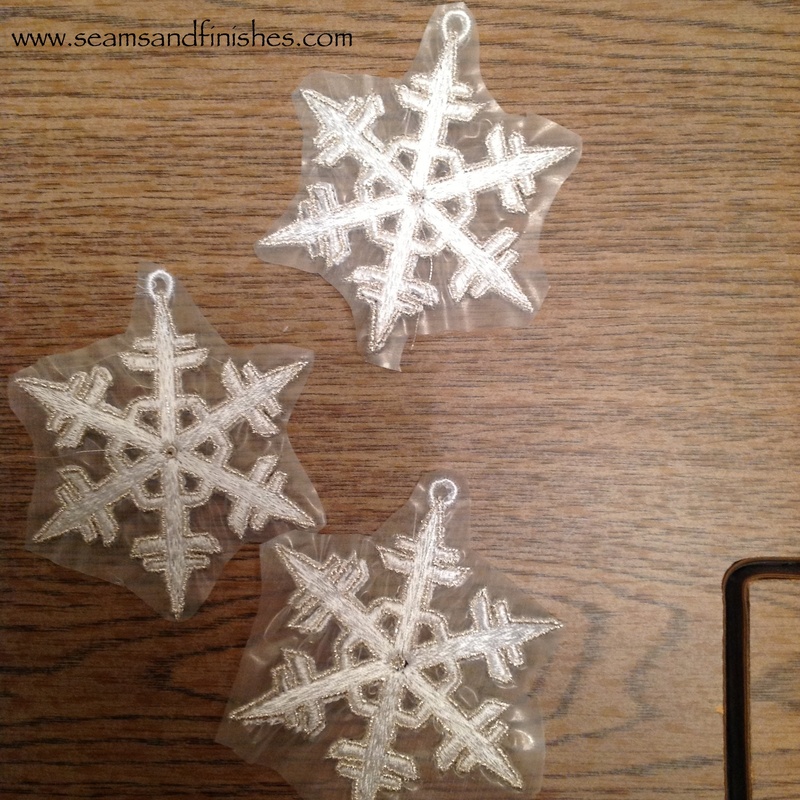 Once they are done, unhoop and trim around each snowflake before soaking the snowflakes in water to dissolve the stabilizer. And here are three different ones that I just made from the same designer. 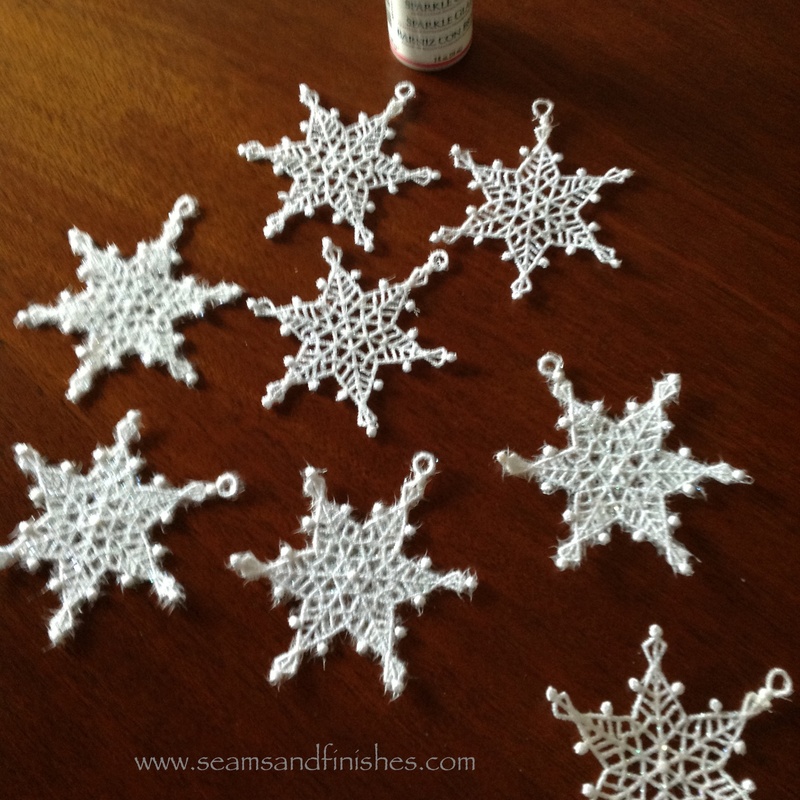 My mailbox has brought me some delightful handcrafted Christmas ornaments over the past few days and introduced me to some talented and creative bloggers whom I might otherwise not found. 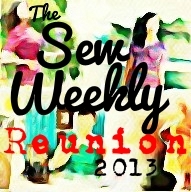 I hope you have a moment to stop by and enjoy these lovely blogs too! The ornaments turned out very well! Congratulations. Thank you! They are a lot of fun to make, too! I have a Pfaff 2170 sewing/embroidery machine. It was TOL when I bought it in 2005, but is no longer made, having been replaced by 3 machines since. BTW, I love the flamingo ornament! Did you know that the plastic flamingo is native to Massachusetts? There is one included in the exhibit at the Boston Museum of Science as a bird that is found in this climate! “Flocking” someone’s lawn is an occasional fundraising endeavor! These are so cute. They would make awesome gift decorations too. I am going to try these next year! You’ll love how they turn out, and they do make great add-ons to gift wrapping! I was wondering how you made those! Amazing, love the touch of glitter! Thank you again, happy new year! You’re so welcome! I enjoyed your photos and post about the ornament exchange. Now I’m going to enjoy your wedding photos! Much happiness to your future.